The ­­Seaside Gallery. They had a great variety of work. I particularly like their small alcoves and viewing areas. 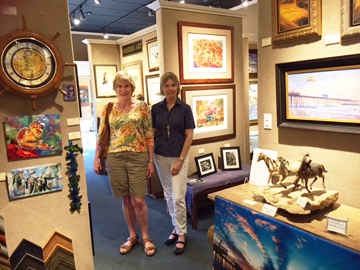 The work was quite good and Sherie Burgher, VP of Gallery Operations, was very helpful and knowledgeable. On to Cambria where we stayed at the Sea Otter Inn on Moonstone Beach. 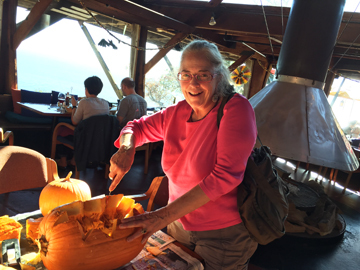 We arrived late afternoon and walked around town and as it was Halloween and not “season” most stores were closed. Had an excellent dinner at Centrally Grown restaurant. In the morning I did some ART TIMES work and then we headed up the coast. We were stopping very frequently to see the glorious views traveling about 10 miles at most to the stop. 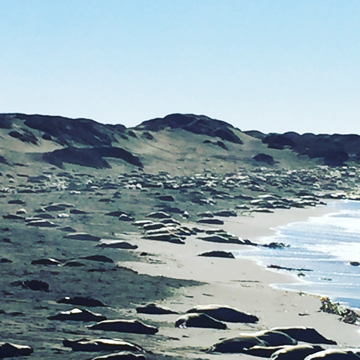 We stopped at Elephant Beach to see the Northern Elephant Seal, Mirounga angustirostris, an extraordinary marine mammal. It spends eight to ten months a year in the open ocean, diving 1000 to 5800 feet deep for periods of fifteen minutes to two hours, and migrating thousands of miles, twice a year, to its land based rookery for birthing, breeding, molting and rest. 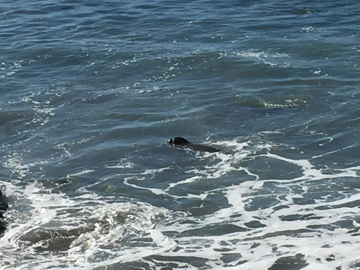 The Piedras Blancas rookery, on Highway 1 seven miles north of San Simeon on the California Central Coast, is home to about 17,000 animals over the course of a year. 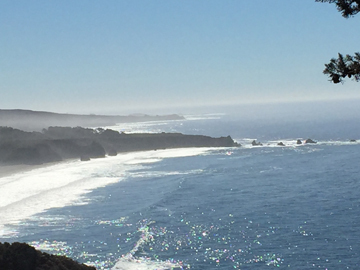 The drive up the coast had one gorgeous scene after another. 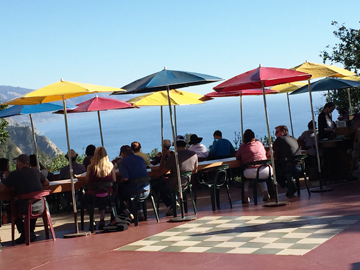 We had Lunch in Big Sur at Nepenthe, a restaurant about 800 feet above the ocean that has fabulous views and was designed by a student of Frank Lloyd Wright. Food was excellent and we had the famous Ambrosia burger. I helped the wait staff with their pumpkin carving and they were quite appreciative. 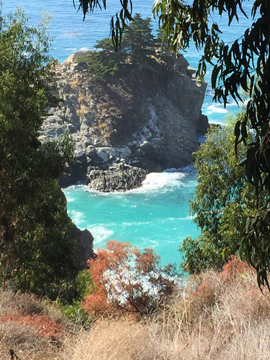 We stopped by the Julia Pfeiffer Burns State Park where the views were spectacular. We didn’t choose to do any of the very picturesque hikes— the park is known for a magnificent waterfall — we just stood on the path and gaped at the view. 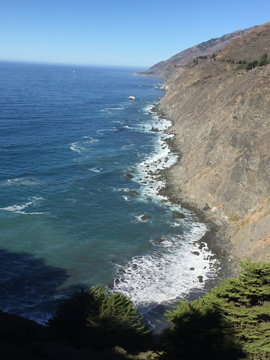 We crossed the very beautiful Bixby Bridge, passed by Esalan where I had stopped about 40 years ago on a very different trip along the coast and then to Carmel which had been quite an artist community. We walked around town and the many very substantial galleries along with fine restaurants, jewelry and clothing stores spoke of a much more monied place than I remember. 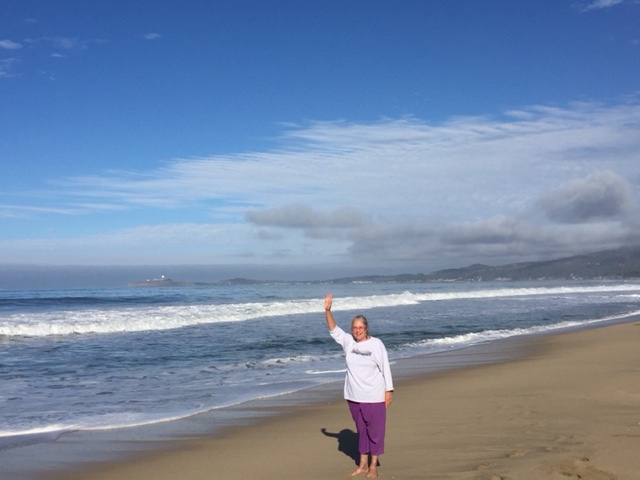 We continued on to Half Moon Bay where we slept at the Half Moon Bay Lodge and had a very nice breakfast and walk on the beach before heading up to San Francisco to meet with my niece Elliana Spiegel.